What’s a (Poor) Lady to Do? It’s been a while since I started doing (and finished up) regular Fashion Forecasts here...and one corollary of that is that I’ve since acquired a lot more prints for any given year. 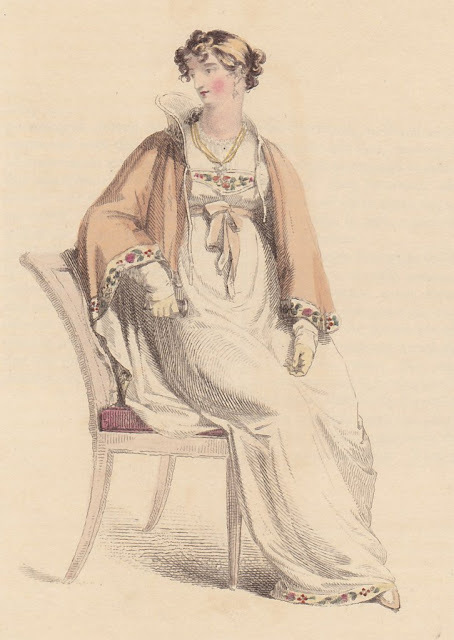 Since the last time we looked at fashions in the year 1813 was back in 2010, I thought I’d post some more prints from my collection...because, eye candy. 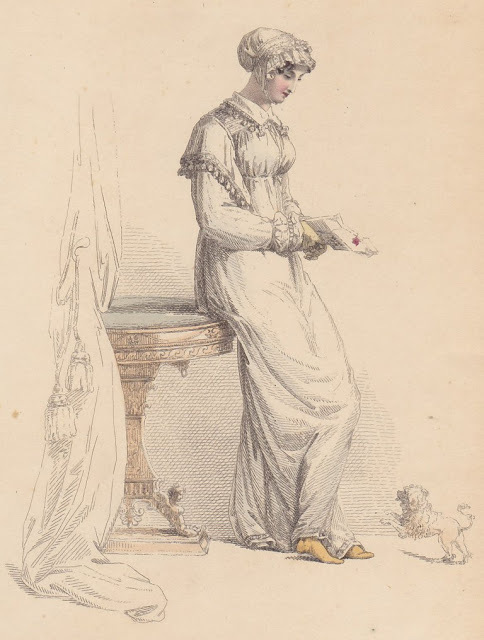 All prints are from Ackermann’s Repository, many with the original descriptions. Enjoy! 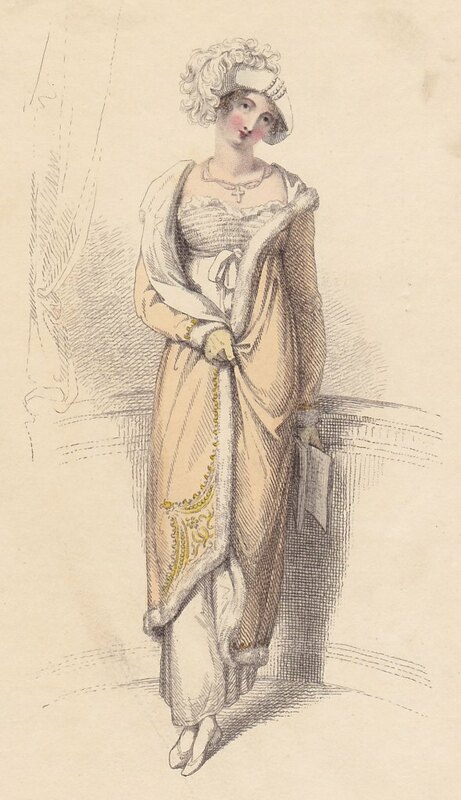 Also from March is an Opera Dress “A round low dress, of fine India muslin, the bosom composed entirely of needle-work and lace beading, and a correspondent border round the bosom; and confined round the waist with a sash tied in front. A robe pelisse, of fine amber-coloured cloth, or satin; bordered round in shaded brown chenille, with deep and rich corners. The pelisse lined throughout with white satin or sarsnet; and trimmed entirely round, and at the wrists, with a full swansdown border. 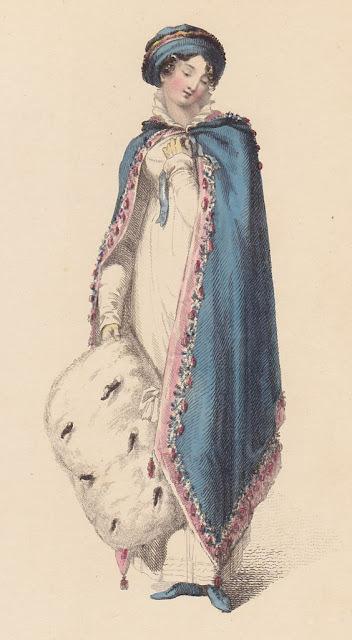 A white satin hat, of the Spanish form, turned up with three rows of white beads or pearl; a curled ostrich feather waving towards one side. A neck-chain and cross of the satin bead, with earrings en suite. Gloves of white kid; and slippers of satin, the colour of the pelisse, trimmed with fringe. A fan of ivory, or crape, decorated with fancy feathers." 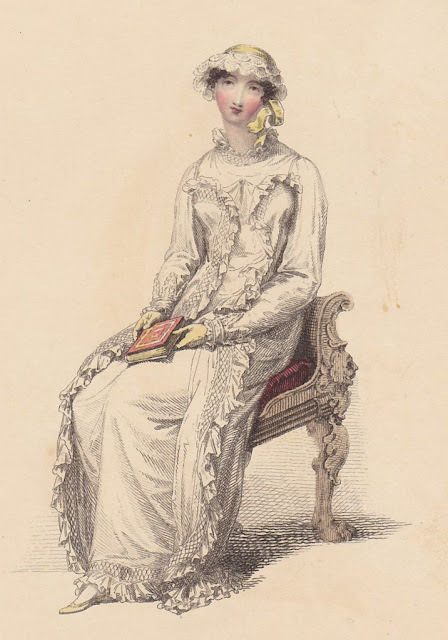 April brings a very frilly Morning Dress, for which I don’t have the text...but did I mention it was very frilly? And perhaps ruffled as well? Note the cap, daintily decorated with three rows of scalloped lace. 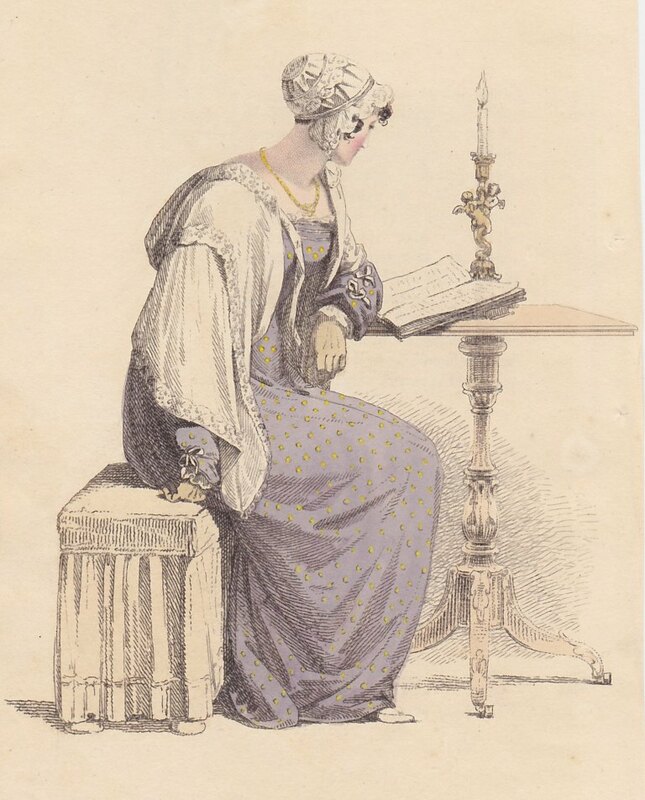 We’ll do more of my 1813 acquisitions in a week or two. Got any favorites among these?